Predecessor Arch A. Moore, Jr. Successor Arch A. Moore, Jr. Governor Arch A. Moore, Jr. 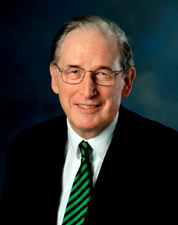 Predecessor Robert D. Bailey, Jr.
John Davison Rockefeller IV, known as Jay Rockefeller, born June 18, 1937 (age 81), is a former United States Senator from West Virginia. He was a member of the Democratic Party and voted with a majority of his Democratic colleagues ninety-two percent of the time in this current Congress. He is the great-grandson of John D. Rockefeller, the grandson of John D. Rockefeller, Jr. and the son of John D. Rockefeller III. He is the nephew of former Vice President and New York Governor Nelson Rockefeller. In an April 2008 interview, he attacked former prisoner-of-war John McCain's service as a Naval aviator. He told the Charleston Gazette, "McCain was a fighter pilot, who dropped laser-guided missiles from 35,000 feet. He was long gone when they hit. What happened when they get to the ground? He doesn't know. You have to care about the lives of people. McCain never gets into those issues." Despite Rockefeller's claims, laser-guided missiles did not come into service until after Senator McCain became a prisoner-of-war and McCain was engaged in a low-level attack on a heavily defended power plant in Hanoi when he was shot down. In fact, he was never at a distance of 35,000 feet during his combat missions. It must also be noted that John McCain was not a fighter pilot. Contrary to Rockefeller's ignorance about the U.S. military, fighter pilots do not engage in bombing; they are responsible for protecting bombers. They generally engage other aircraft and most of their targets are air-to-air. Rockefeller later apologized for the comment, saying he had made an "inaccurate and wrong analogy" and regretted his "very poor choice of words". Once Saddam was overthrown, many Democrats changed their position on the war. Senator Jay Rockefeller said, "It is my belief that the Bush administration was fixated on Iraq... The committee has concluded that the administration made significant claims that were not supported by the intelligence." On January 11, 2013, Senator Rockefeller announced that he will not seek re-election in 2014. This page was last modified on 21 July 2016, at 09:50.